The French Grand Prix (1906-1967: Grand Prix de l'ACF, 1968-2008: Grand Prix de France) was a race held as part of Fédération Internationale de l'Automobile's (FIA) annual Formula One (F1) automobile racing championships. Grand Prix motor racing started in France. The French Grand Prix was open to international competition. It is the oldest Grand Prix race. It was first run on 26 June 1906, under the Automobile Club de France in Sarthe. 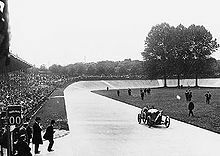 The first race had a starting field of 32 automobiles. The race has been held at several racetracks in France, such as the Autodrome de Montlhéry. Since 1991 its permanent home was the Circuit de Nevers Magny-Cours (often called just Magny-Cours). The move to Magny-Cours was an attempt to stimulate the economy of the area, but many within Formula One complained about the remote nature of the circuit. On 29 March 2007 it was announced by the FFSA, the race promoter, that the 2008 French Grand Prix was put on an indefinite "pause". This suspension was due to the financial problems of the circuit. Many in F1 did not like the circuit because of the remote location. On 31 May, Bernie Ecclestone confirmed that the 2007 French Grand Prix would be the last to be held at Magny-Cours. After negotiations, the future of the race improved. Ecclestone himself stating "We're going to maybe resurrect it for a year, or something like that". On 24 July, Ecclestone and the Prime Minister of France met. They agreed to try to keep the race at Magny-Cours for 2008 and 2009. On 27 July, when the FIA published the 2008 calendar with a French Grand Prix scheduled at Magny-Cours. The 2009 race, however, was again cancelled on 15 October 2008, with the official website citing "economic reasons". A major remodeling project of Magny-Cours ("2.0") was planned, but canceled in the end. FFSA, the race's promoter, started looking for an another host circuit. There were five different proposals for a new circuit. One in Rouen with 3 possible layouts: a street circuit, in the dock area, or a permanent circuit near the airport. A street circuit located near Disneyland Resort Paris. A location in Versailles. And one in Sarcelles (Val de France). They were all were canceled. A final location in Flins-Les Mureaux, near the Flins Renault Factory was considered, that was canceled as well on 1 December 2009. In 2010 and 2011, there was no French Grand Prix on the Formula 1 calendar, although the Paul Ricard Circuit has proposed itself for 2012. The French Grand Prix was not included in the released 2012 schedule. ^a Louis Chiron won the 1931 race, but shared the win in the Bugatti with Achille Varzi. ^b Juan Manuel Fangio won the 1951 race, but shared the win in the Alfa Romeo 159-car with Luigi Fagioli. 1 1985, Race started on BBC One but coverage of the race moved to BBC Two because of other scheduled programming. ↑ "French GP under threat for 2008". ITV-F1.com. 2007-03-29. Archived from the original on 2008-01-08. Retrieved 2011-07-19. ↑ "F1 will quit Magny-Cours after 2007". ITV-F1.com. 2007-05-31. Archived from the original on 2008-02-28. Retrieved 2011-07-19. ↑ "Magny-Cours set for reprieve". ITV-F1.com. 2007-01-01. Archived from the original on 2007-09-29. Retrieved 2011-07-19. ↑ "Formula One hope for Magny-Cours". bbc.co.uk. BBC Sport. 2007-07-24. Retrieved 2011-07-19. ↑ "Grand Prix de France". gpfrancef1.com. 2009-07-28. Retrieved 2011-07-19. ↑ "Magny-Cours to get a facelift". grandprix.com. Inside F1, Inc. 2008-06-19. Retrieved 2011-07-19. ↑ "Magny-Cours 2 Projet de modernisation-standardisation du Circuit de Nevers Magny-Cours" [Magny-Cours 2 Modernization Project: Standardization of the Circuit de Nevers Magny-Cours]. automobilsport.com (in French). 2008-06-20. Retrieved 2011-07-19. ↑ "La F1 de retour à Rouen ?". motorlegend.com (in French). Moteurs & Légendes. 2008-06-20. Retrieved 2011-07-19. ↑ "Rouen to bid for the French GP". grandprix.com. Inside F1, Inc. 2008-06-19. Retrieved 2011-07-19. ↑ Ee, Samuel (2008-10-22). "Euro Disney the next venue for French GP?". asiaone.com. Singapore Press Holdings Ltd. Co. Retrieved 2011-07-19. ↑ Joseph, Noah (2008-11-21). "Disney Grand Prix plans shelved". autoblog.com. AOL Inc. Retrieved 2011-07-19. ↑ "Versailles possible for French GP". ↑ "More about a race at Versailles". grandprix.com. Inside F1, Inc. 2007-12-11. Retrieved 2011-07-19. ↑ "Sarcelles bidding for a Grand Prix". grandprix.com. Inside F1, Inc. 2008-09-17. Retrieved 2011-07-19. ↑ "More details emerge from Flins-Mureaux". GrandPrix.com. Inside F1, Inc. 2009-03-16. Retrieved 2010-07-29. ↑ Noble, Jonathan (2009-12-01). "French GP plans suffer fresh blow". autosport.com. Haymarket Publications. Retrieved 2009-12-01. ↑ "Paul Ricard Confirme sa Candidature pour 2011". Wikimedia Commons has media related to French Grand Prix. This page was last changed on 18 April 2018, at 11:07.